Avoid a Dangerous Bus Accident in Phoenix | Phoenix Personal Injury Law Blog - Breyer Law Offices, P.C. The bus pulls out of traffic and onto the shoulder of the road in order to pick up bus patrons who are waiting at a bus stop, but the bus driver fails to yield to bicycle riders who are in the bike lane or who are traveling on the shoulder of the road. 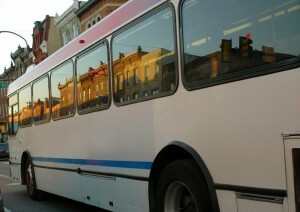 A bus pulls out into traffic after picking up passengers without waiting for vehicles that are already traveling at full speed in the lanes of travel. This is a common cause of side swipe incidents and rear-end collisions that involve a bus and another vehicle. The bus pulls up to the curb and accidentally hits an individual who is waiting for the bus because the driver pulls the bus too close to the curb or because the patron is waiting too close to the edge of the sidewalk or the breezeway. Children or adults riding on a school bus or a mass transit bus are injured in a collision that involves the bus they are riding on. In this case, it does not typically matter which driver is at fault for the collision, although the driver of the bus involved and the bus company or school district may face serious charges and damages if the passengers sustain injuries. It is highly unlikely in the event of a bus collision that you will be dealing with the bus driver who was involved. Instead you will be dealing with the bus company, their insurance company and their attorneys. A leading injury attorney can help you navigate the ins and outs of dealing with this type of situation so that you are properly compensated for your pain and suffering.